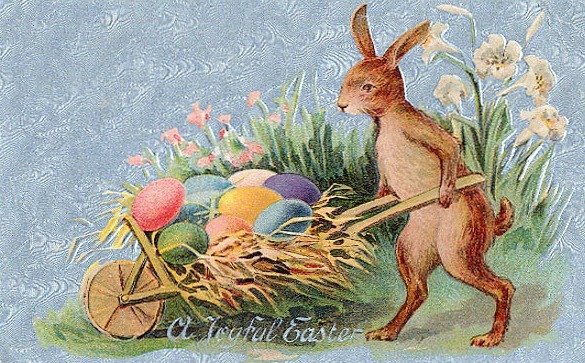 Easter Bunny Postcard circa 1915. Perhaps the most unique variety of fashionable Easter egg in 1893 was the one made of plain, hinged wood that, when opened, revealed an interior bursting with rosebuds, violets, and other spring flowers. For those of simpler taste—or more moderate means—plain eggs boiled and dyed were the most popular Easter eggs of all. Onion peel added to boiling water would dye an egg terracotta brown. A spoonful of aniline dye would tint an egg “a fashionable, but unbeautiful” magenta. And if one wanted to dye their Easter eggs a “lovely ebony-black,” the Tamworth Herald advises boiling them in a mixture of young rye and water. By 1897, commercial Easter egg dyes were also available. 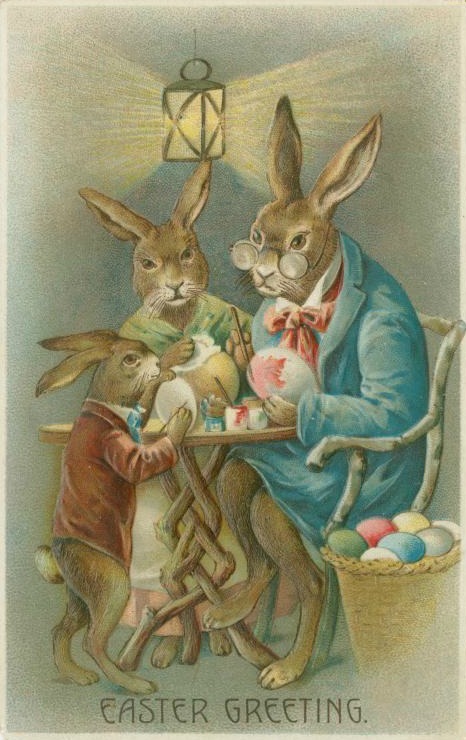 In fact, Donnell Manufacturing, a St. Louis based company, was the first to capitalize on the German myth of the Easter hare by using colored lithographs of four white rabbits and eight colored Easter eggs to advertise their White Rabbit Easter Egg Dye—which included directions in both German and English. Their idea caught on like wildfire and it wasn’t long before imitators sprang up throughout the country. Savvy marketing, like that employed by Donnell Manufacturing, was not the only influence on the rise in popularity of the Easter bunny. By the end of the century, many German immigrants had brought the tale of the Easter hare along with them to their new homelands. 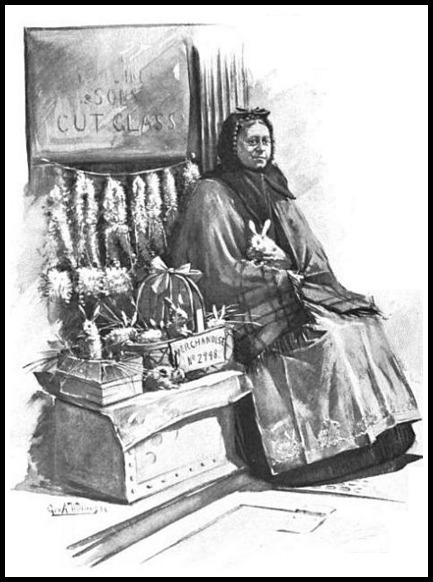 For example, an 1899 American magazine reports the story of Frau Zehner who was known as the “Rabbit Woman” of New York. Zehner was a German born street peddler who made a tidy profit each Easter by selling “little bunnies” in every imaginable color. By the turn of the century, confectioners were making chocolate bunnies and Easter cards were featuring rabbits on their covers. 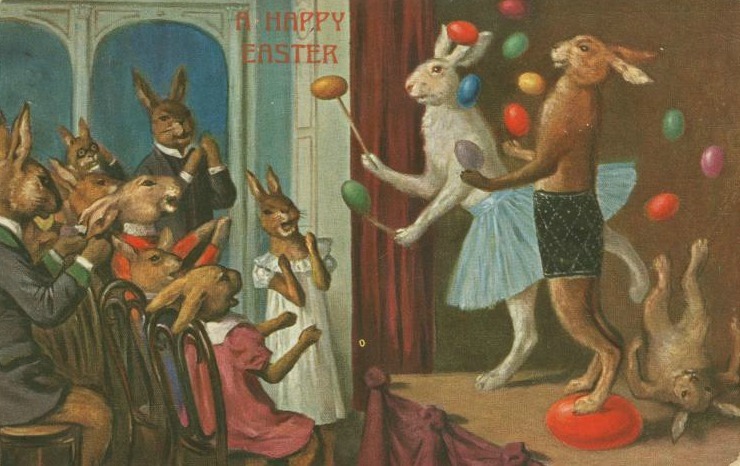 Soon, images of rabbits at Easter were almost as common as images of Easter eggs themselves. Today, the Easter bunny is an inextricable part of the Easter festivities in England and America. In many ways, he is as much a holiday icon as Santa Claus. Obviously he is not real, but as March 27 is Easter Sunday, I hope you do not mind that I have included him as part of my Animals in Literature and History series. To those who celebrate it, I wish you all a very Happy Easter weekend with your family and friends, both human and animal. As for myself, I will be spending Easter with my own family, complete with Easter eggs and Easter bunnies (of the chocolate variety!). *Author’s Note: Sunday is Easter and in some places this means baby bunnies, chicks, ducklings, and kittens will be sold or given away as Easter presents. Baby animals are very cute and I understand the temptation to put one in a child’s Easter basket, however, I hope that before you do so you will first consider the long-term commitment to the baby animal’s health and welfare. “About Easter Eggs.” The Tamworth Herald. April 8, 1893. Beard, Linda. How to Amuse Yourself and Others. New York: Scribner & Sons, 1893. 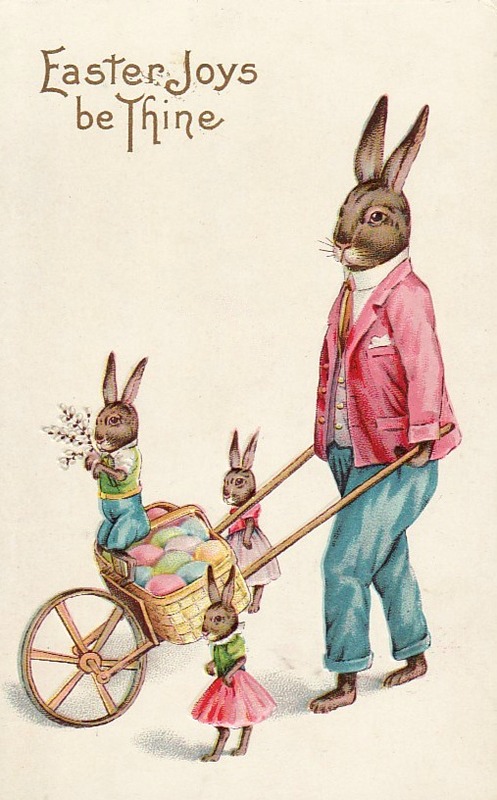 “The Hare and Easter.” American Notes and Queries. Volume 5. Philadelphia: Westminster Publishing, 1890. “Occasional Notes.” The Cornishman. June 30, 1892. Williams, George. “The Rabbit Woman.” St. Nicholas Illustrated Magazine. Vol. 26. New York: MacMillan and Co., 1899. “Special Notice to the Trade.” National Druggist. Vol. 27. St. Louis: Druggist Publishing, 1897. Do you know the story of Mary Toft who gave birth to baby bunnies in Godalming? I don’t, but it sounds fascinating! Have you written on it, Liz? Do you have a link? Thanks, Liz :) I just read it. I wonder how on earth that woman thought up such a hoax? Truth really is stranger than fiction sometimes! Another entertaining and informative animal article. I love all of your blog entries, but I’ve come to especially anticipate the Friday animal series. Thanks also for always including sound advice and links to animal adoptions. You’re very welcome, Andrea :) I’m glad you enjoy my animal posts. They’re my favorite to research! Amazing to see the start of these traditions…so we owe the Easter Bunny , like the Christmas tree, to German origins, and it has to be said, forest sensibilities. The Germans did have some pretty great holiday traditions :) And the Easter bunny is definitely linked to nature. The same as the Easter egg! In UK in 40s we’d collect gorse flowers (yellow) and use them to dye the eggs. I think everyone did that then, it was tradition. We thought colouring any other way was overwrought and ostentatious. And of course the best part were the chocolate eggs. Dark chocolate only. And eating till sick. And take note they are NOT bunnies, they are hares – Mad March Hares and many other associations with women, easter, birth etc etc I prefer Hares to bunnies – they’ve got more character. Oh yes, rabbits/hares have been a symbol of Spring and new birth for a very long time. Very interesting. I had always thought the Easter bunny (hare) came originally from England. No, you did not dash my belief in them but strengthened it. Even thought I’m old enough to know they aren’t real as a child I believed in them and Santa Claus. When I was a child, I believed in the Easter bunny, too, Lindsay :) And in many ways, I liked him more than Santa Claus precisely because the Easter bunny was an animal! This sounds absolutely stunning! I wonder if the flowers inside were real blooms or wooden ones carved from the same material as the egg by some skilled artisan. Either way, it would be lovely. They were actually real flowers! There was a mechanism inside to fill with water so the flowers would last more than a day. I’m not entirely sure how the whole thing was accomplished–perhaps the florist bought the wooden eggs and then made them up with the flowers as the orders came in? Very interesting! 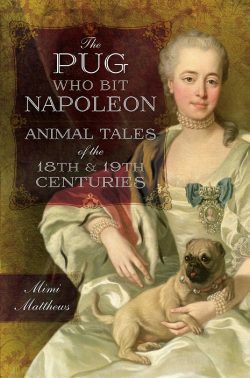 I confess, I don’t know as much about animals in medieval times as I do the 18th & 19th century. Took me a while to dig it up after noticing how often images of rabbit warrens showed up in MSS. It’s one of those fabulous “Oh, by the way, did you know…” things one can drop into conversation to impress…or annoy! There is nothing more exciting to a youngster than the Easter Egg hunt! Thank you for this lovely article on the Easter Bunny – I did not know the origin of the Easter Bunny before. As always you have educated and entertained us and promoted the welfare of our furry and feathered friends! Bless you and Happy Easter! Thank you so much for your kind words :) Have a great Easter weekend!